A painting on the themes of genre scenes from life, painted in oil on canvas. Like many other works of the artist in this genre, the picture was very kind and tender. A deep and clear look at the family life of ordinary people, families. The foreground shows a dinner table where two girls and their mother gathered for dinner. The girls’ hands are folded into a prayer figure, and they humbly and obediently listen to their mother, who teaches them to pronounce prayers before eating. 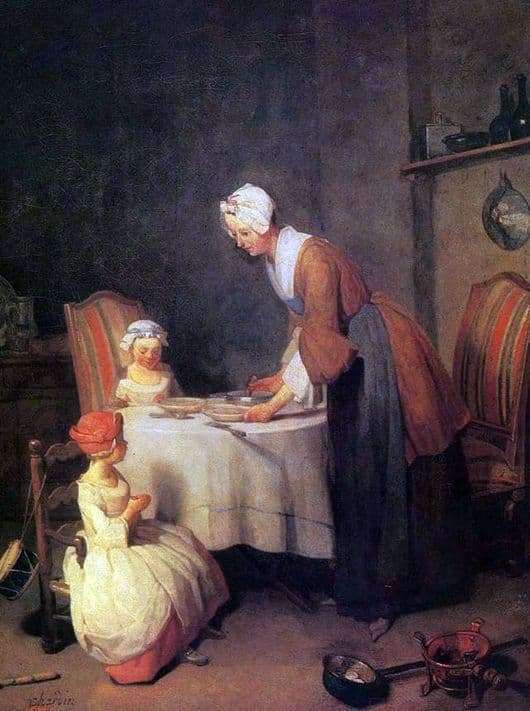 The mother, arranging the dishes for dinner, does not forget to repeat the words of prayer to her daughters. A very touching and tender scene that makes you feel the spirit of love for close people, for God. Also in the picture are the toys that the girls obviously played just recently, before sitting down at the table. This drum and pipe. The artist with this fragment conveyed the true obedience and humility of the children before the mother, their meek and kind disposition. Despite the fun and games, they show seriousness and honor to the will of the mother. The landscape surrounding the main faces speaks of the average income of the family. They can not be called poor, because the girls’ dresses are quite beautiful, neat and magnificent. But it is also difficult to attribute to the rich, since the background shows a rather scanty and modest atmosphere in the house. The picture is not replete with bright colors and vivid palette. However, this is what gives it a special charm and refinement. The white colors that prevail in children’s clothing underline their innocence and early age. The brown, gray, dark yellow tones of the mother’s clothes and the surroundings confirm the realism and vitality of the picture. In general, the picture is very holistic, revealing the plot to the fullest. Looking at her, covers a sense of tenderness, warmth and comfort.